On June 28th ESI Video prepared and produced a Facebook LIVE Stream for Custom Building Products of Santa Fe Springs. Custom Building Products is an industry leader in flooring preparation products and tile and stone installation systems for both commercial and residential projects. Custom Building Products has also established itself as an online resource for contractors and homeowners alike, providing guidance especially through their popular tutorial videos from their Custom Technical University. With the help of ESI, Custom Building Products took these videos to the next level by producing a completely live 20 minute show featuring Fusion Pro Single Component Grout. To tackle the technical challenge of shooting a Facebook LIVE stream, ESI arrived to the site several hours before Custom Building were set to go live to begin the necessary set up. The ESI crew provided camera ready lighting for the two room shoot, expertly placing lights to prevent glare from bouncing off the building materials. The grip team also had the tools to match the mixed sunlight and florescent lighting found in the two sets. To capture this two set show ESI utilized a moveable two camera set up which allowed for a close up and wide shot at both locations. To ensure crisp audio, the two hosts and three contractors with speaking roles were given lavalier microphones. The two video feeds as well as Custom Building Product's pre-made graphics were switched live using the ATEM Television Studio. The feed was then streamed live through Facebook to Custom Building Products' 47,000 followers. This mobile production studio is perfect for clients who want to broadcast a live show at any of their locations. As more and more business look to utilize social media and live video ESI Video can provide a professional turn-key solution. You can check out a replay of the live show on Custom Building Products' Facebook page or by clicking here! On June 22, 2018 the CHOC Children's Foundation held their annual Charley Awards Luncheon. The Charley Awards, which is named in remembrance of Charles W. Hester, a beloved former board chairman at CHOC, recognizes seven honorees who exemplify his ideals of philanthropy and volunteerism in the CHOC Children's community. 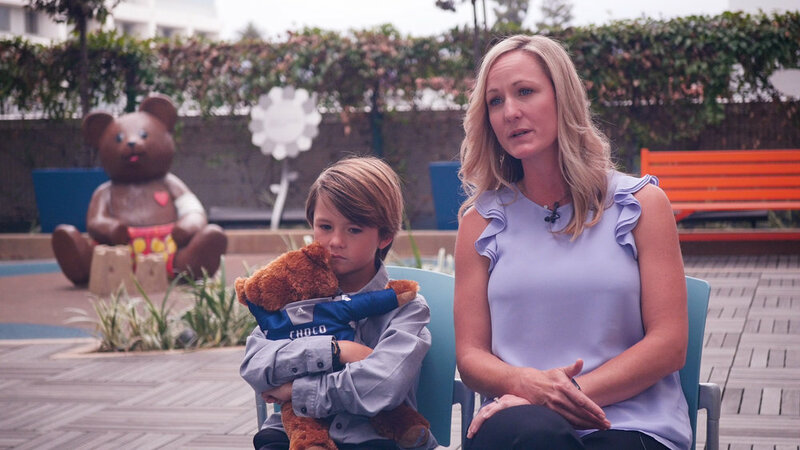 Through the months of May and June ESI Video worked closely with the CHOC Children's Foundation to plan, film, and edit individual videos about the seven honorees and the generous work they put in to helping the children receiving outstanding care at CHOC Children's Hospital. In each video the honoree was introduced by a colleague or a CHOC Children's Foundation board member. This introduction was followed by a grateful family who told their story about their time at CHOC and how that honoree helped provide some of the best medical care available though volunteering or generous donations. To film these videos ESI Video worked with the busy schedules of medical staff members, board members, music therapists, and the grateful families. The ESI team also adapted to a variety of locations across the CHOC facilities, creating light and camera set ups in playrooms, libraries, hallways, and examination rooms. Some interviews were also shot on green screen. In editing, ESI worked diligently to create a clear and meaningful story for each two minute honoree video. Gerald Cromwell, ESI's head editor, promptly accomplished this creative challenge, sifting through interviews, footage, and still images to find the best soundbites and visuals. Using Adobe After Affects Gerald also created custom graphics and animations for the Charley Awards. The editing process and graphics were completed on schedule to allow for the CHOC Foundation to review the project before the event and to suggest any minor changes before finalizing the videos. On April 26, 2018, OneOC held their Spirit of Volunteerism Awards at the Disneyland Hotel Grand Ballroom. This event honors the outstanding volunteer work completed by organizations, businesses, and families in Orange County and this year marked the 60th Anniversary of OneOC. 359 volunteers from 95 non-profits and 30 companies were recognized. The Community Action Partnership of Orange County OC Food Bank and the PIMCO Foundation were among those honored for their service to the community, receiving the prestigious 2018 Giving is Living Award . The two organizations were recognized for their joint work in feeding and helping those in need during the holiday season. The Disneyland Resort was also recognized as OneOC's Diamond Anniversary Sponsor and Mickey Mouse joined in on the festivities, traveling all the way from Toon Town to give thanks to these giving organizations. ESI Video produced and directed the live show and edited honoree videos that featured the honoree's name and picture. ESI collaborated closely with Disneyland Cast Members to dial in lighting and music cues as well as projecting the speaker on the big screens or IMAG, throughout the ballroom. In addition to directing the show ESI Video was also on site to capture the event and edit a highlight video which was featured on OneOC's website and Facebook page. You can check it out here! On April 2, 2018, Kobe Bryant brought some of his "Mamba Mentality" to an event hosted by the USC Performance Science Institute and USC's Marshall School of Business. The former Lakers player and 18-time All-Star spoke to students about his mindset while playing basketball, his experience finding new talents and passions after completing his career as a professional athlete, and about the necessity of protecting your dreams and imagination. The event was held soon after Bryant won an Oscar for Best Animated Short Film at the 2018 Academy Awards for his short "Dear Basketball", which was played for students before Bryant's talk. Bryant took questions from USC students and even one from former USC football head coach and current Seahawks head coach Pete Carroll. Students asked Bryant a variety of questions such as how his competitive nature translates to his new career and his views on mental health in professional athletes. President and controlling owner of the Lakers Jeanie Buss also made a special appearance, praising Bryant for his leadership and dedication to the Lakers even when the organization was not of the same caliber as Bryant. Bryant took the opportunity to speak to the students about the value he places on commitment when working with a team. At the end of the night current USC football head coach, Clay Helton, presented Bryant with a USC jersey personalized with Bryant's name and number. The event was held at USC's Bovard Auditorium and was captured with multiple cameras. ESI Video primarily captures live events with the Panasonic DVX200 4K Camera. You can check out Bryant's full talk on YouTube. On January 31, 2018, the USC Performance Science Institute and USC's Marshall School of Business welcomed Alex Honnold, acclaimed free solo rock climber known for climbing the sheer face of Yosemite's El Capitán without the use of ropes or safety equipment. He spoke with Dr. Michael Gervais, a high performance sports psychologist and host of the podcast Finding Mastery, about mindset and relying on your skillsets when your life depends on it. Dr. Glenn R. Fox, Head of Program Design, Strategy and Outreach, at the Performance Science Institute began the talk by introducing Alex Honnold and breaking down the science of emotion and what's unique about Alex Honnold's brain. The event was held at USC's Bovard Auditorium, ESI Video captured and streamed live on Facebook and Periscope. Utilizing the ATEM Television Studio to switch between 3 cameras and graphics, as well as OBS an open source streaming software to encode and distribute to multiple platforms. The full talk is available to watch on the USC Marshall Facebook page, check it out! On Friday, January 26, 2018, Arianna Huffington, co-founder of the Huffington Post, sat down with students at the University of Southern California to discuss how to thrive in a digital world. The USC Marshall School of Business and the Lloyd Greif Center for Entrepreneurial Studies hosted the event at Town & Gown in USC. Professor and Executive Director of the Lloyd Greif Center for Entrepreneurial Studies, David Belasco, moderated the event with intriguing questions about Arianna Huffington's career, their shared philosophy on mindset, the future of the Huffington Post, and Arianna's next venture Thrive Global. ESI Video helped produce the event by supplying audio and visual services to USC Marshall. The event was streamed live via Facebook Live and Periscope, generating thousands of views for the Business School on social media. The event consisted of audio support inside the ballroom with video monitoring and audio into overflow rooms in the foyer and patio. The event was captured with two Panasonic DVX200 4K Cameras and switched with a Black Magic Design ATEM Television Switcher. You can check out the full video on USC Marshall's Facebook page.